Ok so time to get back on that shifty looking horse and bash out another wine post. We recently visited friends in Ballarat and in what has now become a bit of a tradition I brought a couple of bottles of nice wine for us to taste and wax on about to each other. Although none of us is even close to considering ourselves an expert when it comes to wine tasting (drinking is another matter entirely) we all really enjoyed the process last time and I think we may have even learnt a thing or two... maybe. You can decide for yourself by checking out my post of our last tasting here. As usual I am continuing with my process of putting a Victorian Pinot up against a French Burgundy. Some may consider this an unfair battle but I personally think Victorian Pinot stands up quite well against their French counterparts. Actually they are often so different that comparison yields some quite interesting and stark differences. As the Victorian candidate this time I chose one of my personal favourites, Farr Rising Berry's Creek Gippsland Pinot Noir 2010. It's very well priced at $45 and to me is pure funk funk funk which I just love love love! The Farr Rising winemaker is Nick Farr, son of Gary Farr of By Farr wines. Nick's wines are a lower price bracket which obviously makes them much more attainable. I reckon they are great wines and great value. I'd love to purchase Victorian Pinots at the $100 mark but its so hard to justify when they are sold so young. I mean, I just can't wait 5 years. I want to drink it now! So now to the hard part, here goes. The Farr Rising showed a dull clarity with a pale to medium intensity. We decided the colour was garnet and the condition clean. The wine displayed a pronounced intensity with an aroma that was predominately strawberry fruit and a sweetness that you could almost smell. The acidity was quite concentrated with a balanced chewiness. Flavourwise the Berry's Creek was mildly floral and mostly fruit with a distinct strawberry sweetness that was complimented perfectly by a musky forrest floor funkiness that has me pursing my cheeks in delight. Medium in body and length this wine showed no identifiable faults and a maturity of palate that belied its young age. 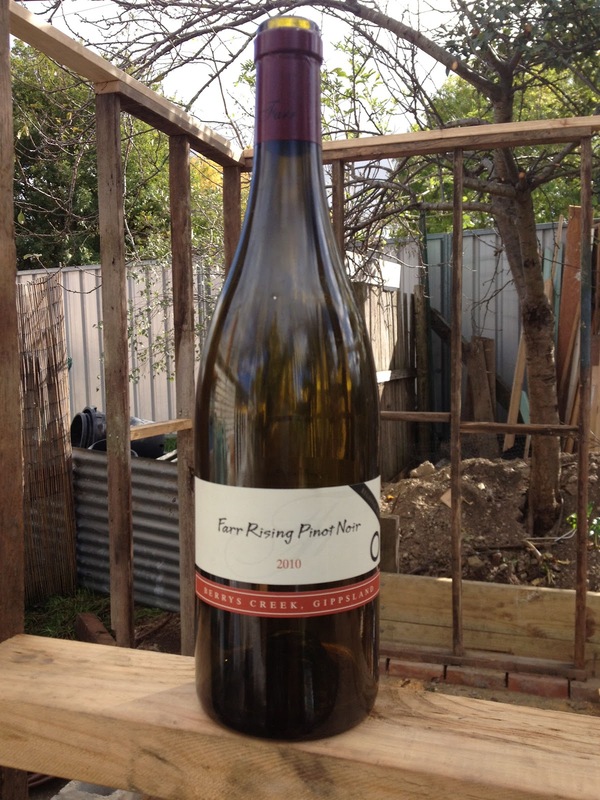 The Berry's Creek is mid range Gippsland Pinot par excellence, a classic fruit and funk driven Victorian Pinot. I rated this wine good/great. It isn't an easy one to find and is definitely worth hunting down, I purchased this bottle from Blackhearts & Sparrows in East Brunswick. I can only imagine how good this wine will be in 5 years time. Come to think of it, I really should grab a half dozen and put them down for a few years. 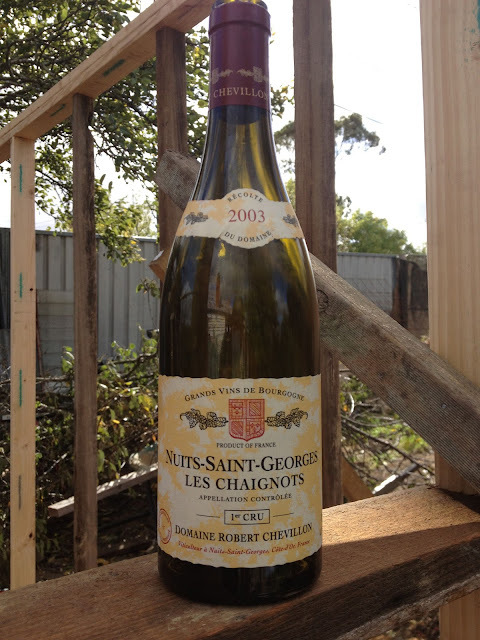 In a completely different weight (and price) division is the Nuits-Saint-Georges 1er Cru Les Chaignots 2003. This bad boy was $105 from my local wine store Parkhill Cellars on Errol Street. These guys usually annoy me with their pretty shallow range of pinot under $30. Sure they have some very good expensive Pinot but I judge a wine store across all price brackets and Parkhill fails on this measure. In saying that, they do have a premium wine cabinet that I am only now developing the skills to full understand and therefore consider purchasing from. I spotted this bottle of Premier Cru sitting there dustily on the shelves and immediately recognised the Nuits-Saint-Georges from my evening of Burgundy Debauchery at our Sommelier friends house a few weeks earlier. I have learnt enough lately to identify that at $105 for a 2003 bottle of premier cru this was a bargain. I love the idea of 'shelf gleaning' (to borrow a term from Lauren) at wine stores to find those older bottles that have been sitting on the shelves for years maturing in quality yet still have the price tag they were given when they were stocked many years earlier. My suspicion was confirmed a few weeks later when I saw a 2009 vintage of the exact same wine for $131 at City Wine Store. In conclusion, both wines were incredibly enjoyable and I felt the musky fruit driven Gippsland Pinot was the perfect lead in to the classically complex French 1er Cru Burgundy. You can read more about Domaine Robert Chevillon here.